You must make reservations at least 5 minutes in advance of the time at Morton's The Steakhouse - World Trade Center. Private and group dining available. Contact our dedicated Sales and Marketing Manager to plan your next business or social event. Hosting a party at your home or office? Ask about Morton’s Prime To Go and Prime Platters! 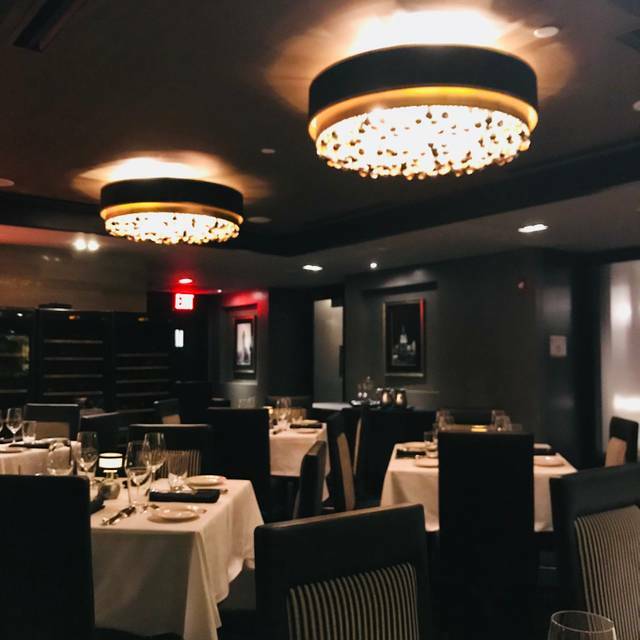 Thank you for choosing Morton’s The Steakhouse - New York (World Trade Center). We look forward to serving you. USDA prime-aged beef, succulent seafood, fine wines, chilled cocktails, decadent desserts, crisp white linens and exceptional service...Morton's serves The Best Steak Anywhere. For more than 30 years, Morton's is the steakhouse by which all others are measured. For special events, Private Dining Boardroom information, worldwide location listing, gift cards and online reservations, visit our website. To ensure we can accommodate any special requests, please call the restaurant directly to confirm. 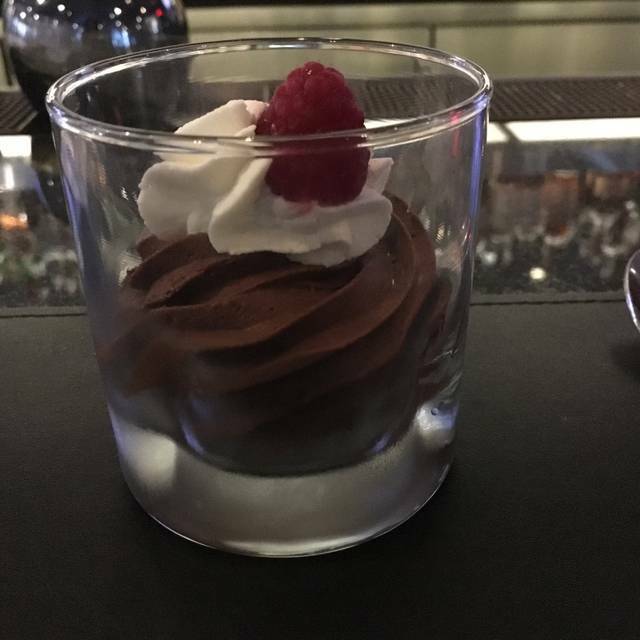 Dined at Morton's Steakhouse WTC location for a birthday celebration and was pleased. 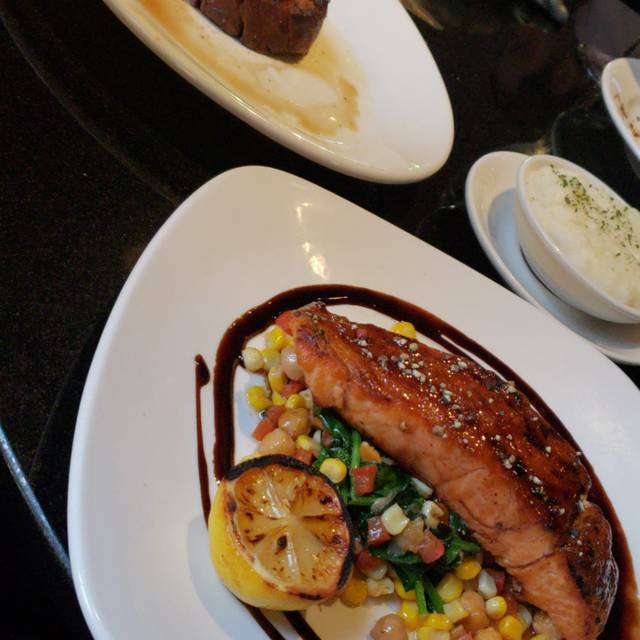 The decor is sleek & modern, the food was fresh & tasty, and the staff gave genuine and attentive service. Two thumbs up! We went to Morton's-WTC to celebrate my birthday dinner this past Saturday night and we had a great time! The service was great throughout the meal and the new york strip and ribeye was fantastic. We had a great time and will be back to celebrate future special events. Lunch was great. Ordered from the lunch PrimeTime special which offers appetizer, enteee and dessert for a special price. Unfortunately, would not recommend. There are so many better choices. Do NOT order the 'Oscar' - they claim it is a large crab cake with 6 asparagus. It comes to you like it was diced up by the ninja slicer. I highly doubt it is more than one asparagus. The crab cake would be miniscule as well. Steak with medium is more like medium well there. I'm not even a foody and I agreed that it was overpriced and that great. For something well over $300 (two drinks each, appetizers and main entrée (no dessert)) - should be better all around. It was for my brothers birthday and the service was nothing short of spectacular! Will definitely be coming back and celebrating other special occasions at this establishment. 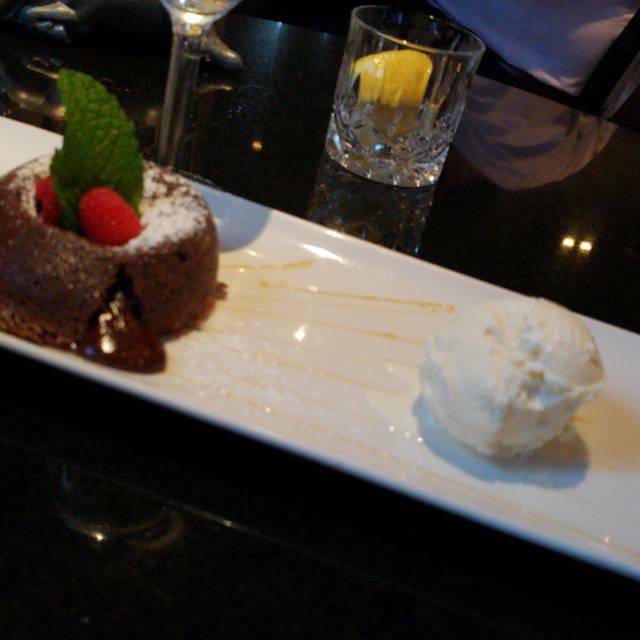 Perfectly done steaks, outstanding sides and desserts as well as great service! Charlie the manager was fabulous! Very welcoming. Waiter was great! Went there for a Valentine’s dinner. Had a great time. Great drink! 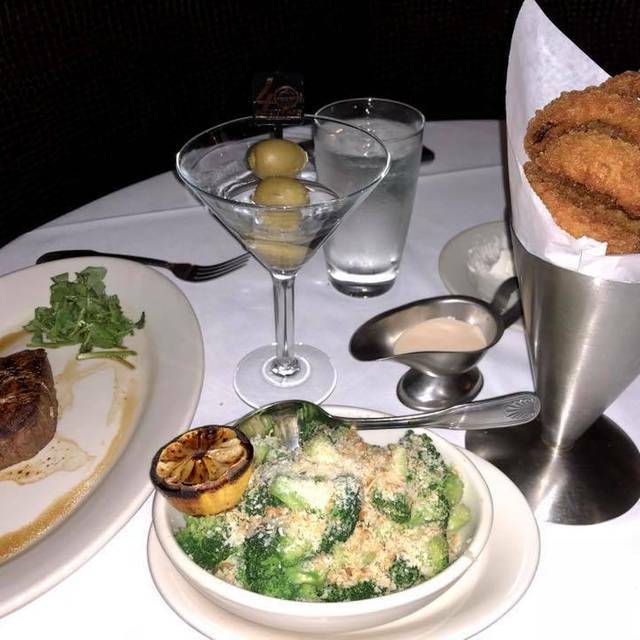 We went to Morton's steakhouse for Valentine's day. The service and food were excellent! They allow you to enjoy your time there and don't rush you by serving the next course 5 mins after your appetizer. 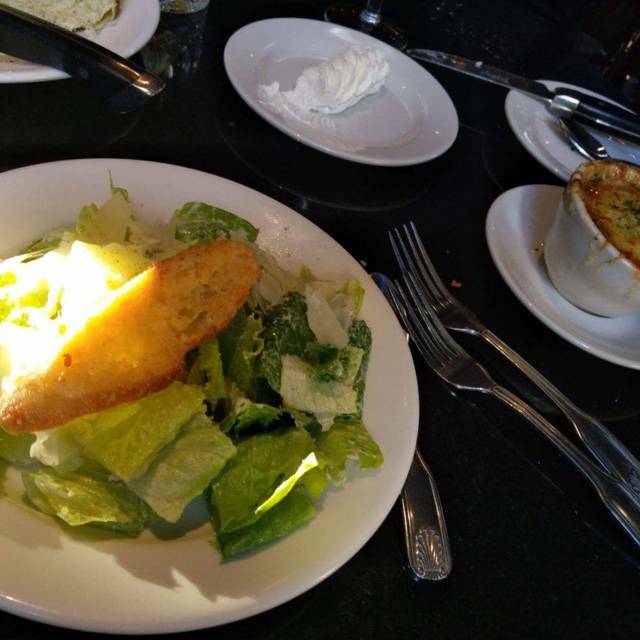 I love the food at Morton's and this time was no different than in the past. Our server, while very nice, seemed to be new because she was unfamiliar with a few things that my friends and I were asking her about and had to keep going back to the manager to ask questions. Also, I called the restaurant the day before to say that we had a person celebrating a birthday. No mention was made when we walked into the restaurant (normally they say Happy Birthday) and when dessert was brought to our table, there was no candle in it. Our server took it back and returned with a candle, but It was a bit disappointing that someone dropped the ball. Hostess didn’t check us in despite me notifying her of reservation upon arrival. Main dining area downstairs was “closed for the night” (It was 9pm sand empty downstairs) so we were seated at a “high top” next to the door, on top of a space heater. It was incredibly hot there as a result so we asked to move, something I NEVER do. I left the table for a few minutes. 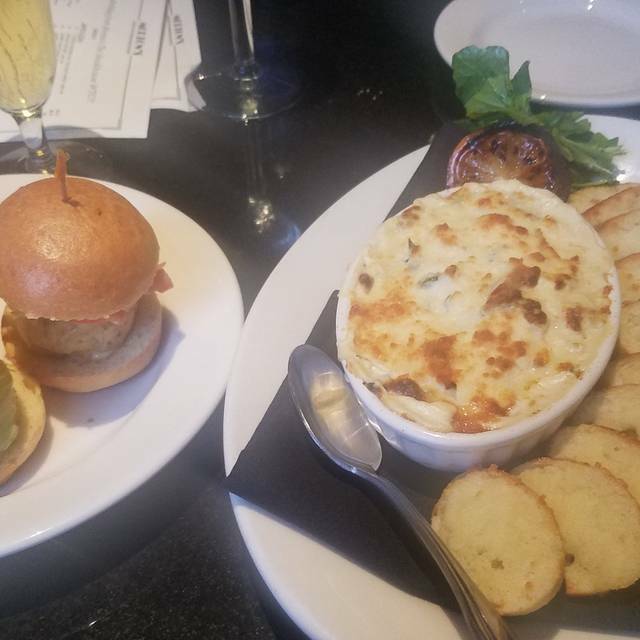 My friend ordered some appetizers in my absence. I then returned and didn’t see much less speak to a server for fifteen minutes. I finally saw somebody and asked if we could order. He went and got our server. I asked him politely if there was any issue with the staffing that evening and he snapped back at me “no I will take your order.” He later apologized and said they were understaffed. An unpleasant and expensive night. My server was good, but my medium steak wasn’t even close. After taking back and correcting it, it was barely different. At that point, since the manager asked me to cut down the middle and thought it looked better, I just ate it and didn’t want to continue making a big deal. The photos are before and after. This wasn’t the first undercooked steak I’ve had at this location. It makes me sad, because amid the severely-undercooked steaks I’ve also had the best steak of my life here. It’s just not consistent. I was excited to try this restaurant for Restaurant Week. The price was great and the food was delicious but our waitress had an attitude. She gave us water once. Took a half to get drinks we ordered. Our food took over 45 minutes. The floor manager didn’t greet us or apaologize for the long wait or the poor attitude of the staff. Our waitress wasn’t even waiting on other tables so I’m not sure why she was barely present. The general manager was wonderful. His name is frank. And Sebastian the other waiter who served us was readily available and very welcoming. He was so friendly and we wished he was our main waiter. The restaurant is beautiful but I won’t return. Food was average; prices were not. There are so so many superior steakhouses in NYC that I’m not sure what purpose Morton’s serves. Food is okay, not amazing for the price, just okay. The service is extremely slow. The waiter barely ever came to check up on our table and our meal took over 2 hours to be served from drinks to check. We even had our desert packaged to go because we couldn't stand sitting there any longer. For the same price or less there are plenty of better options. Excellent food while the service was average. I would return. enjoyed! thanks to the NYC restaurant week. Awesome service. Went here for Restaurant Week and have zero complaints. I made reservations for my boyfriend’s birthday and the service we received was excellent!! We loved the food, drinks, and service .Thank you Charlie for the follow up call to sure our experience was a great one. Thank you Morton’s for helping me make my boyfriend’s birthday special. The staff is friendly. I get my steak well done and I've never had a well done steak that still cuts like butter than their ribeye steak. Everything was amazing especially our server Lisa, amazing personality and so patient.. Thank you. Excellent food and great service! 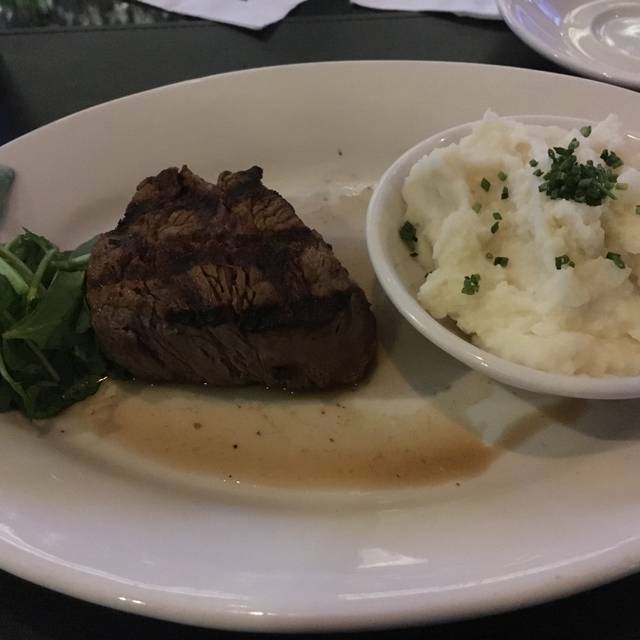 Enjoyed my steak and Mash potatoes. I brought my parents here on 1/29 after going just five days prior with my coworkers - the food was so outstanding that first visit I had to bring my parents. Unfortunately, there were multiple incidents that made the experience much less enjoyable. Of the 3 filet mignon's ordered, the 6oz for my father was PERFECT med-rare but the two 8oz for me and my brother came out close to well done with no pink at all (ordered med-rare). The second attempt came back rare - I couldn't cut into it with my knife. They re-fired it and the third time, it was perfect - but also 20 minutes after my parents were served. 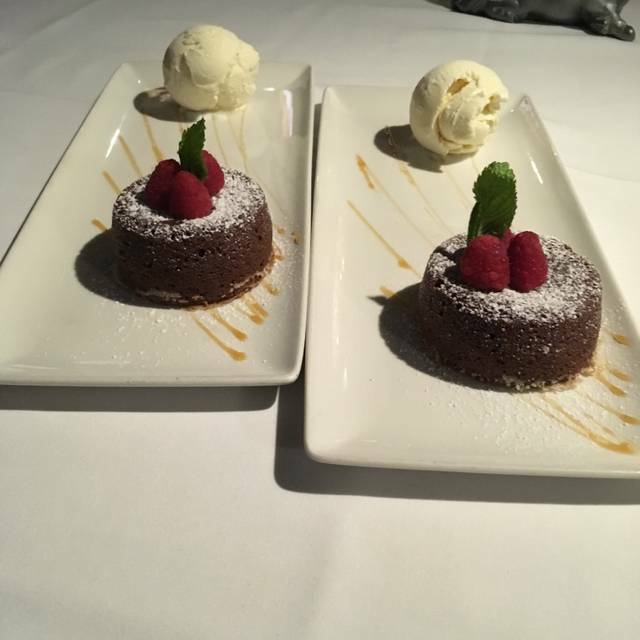 We ordered 2 Mortons Famous Chocolate Cakes for dessert and, again, my fathers came out PERFECT with molten chocolate oozing out. When my brother cut into his, the cake was solid overbaked chocolate cake - no molten chocolate. They brought out the second attempt only 2 minutes later, which right away I thought was odd since when I visited the Thursday prior, I was told they were baked to order and took 10 minutes usually. Turns out the second was worst than the first - solid cake again and was obviously leftover from another order. 15 minutes later a 3rd attempt came out with the manager's apologies and it was delicious. To sum this up, that is 3 attempts on two orders of 8oz med-rare filet mignon as well as 3 attempts on a their namesakes' famous chocolate cake. We were there for the NY restaurant week. So were 80% of the customers there. It’s a decent meal for $42 dollar menu, but nothing more - the salad was plain, soup was ok, the famous filet mignon is ok, the dessert is ok. Hence the 3-star average ratings. The wine list was good, however seriously overprice (expect 300% than what you normally pay). Everything was great MINUS our server Cheyenne, she never introduced herself, would take things off our table without a “excuse me” and/or “are you finished with that” and made the experience sour, tried this place for the first time during restaurant week and she made a potential great experience, extremely sour. Only learned her name once the bill was brought (which was brought over by someone else). Minus that, it was great. The service from when you walked in was amazing. The server and bartender were very nice and attentive. I would defintley recommend this place and will be returning myself. I've done. Morton steakhouse many a time. And they always manage to provide excellent customer service and great tasting food. A friend and I came for lunch with the ingestion of ordering the carrot cake for dessert! It was a great meal with great service provided from Lisa. Thank you to the entire Morton’s staff for a great experience! As always, the food was fabulous. The service was amazing, even though they were very busy. I like how everyone bring the food order out when it is ready, ensuring hot food. We went during Restaurant Week, as that is the best value. I also liked how we could order from the Restaurant Week menu, yet “upgrade” to a larger cut of steak. Love my dining. It is always a wonderful time when I get to eat with the my husband. The atmosphere at Morton is nice and relaxing. The food was delicious. Our waiter had to serve 3 tables , but I didn’t mine. He was trying his best. I had awesome time.